Intimate and interactive, this workshop will be an unforgettable hands-on, team-taught, real-world, collaborative and inspirational learning experience. 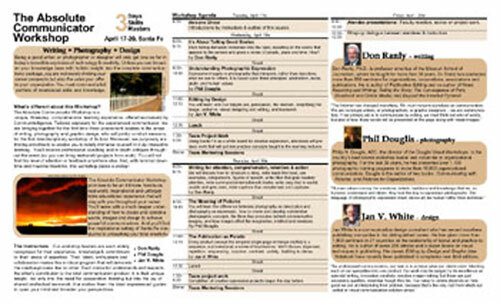 Created concept, text and design for this brochure promoting the conference held in Sante Fe, New Mexico. Being a good writer, or photographer or designer will only get you so far in today’s explosion of technology and creativity. Unless you can broaden your knowledge base with holistic insight into the complete communications package, you are not merely limiting your career prospects but also the value you offer to your organization. You must command a full portfolio of interrelated skills and knowledge. I invite you to join us on a journey of personal and professional discovery, one that’s tailored expressly for the experienced communicator. This opportunity will open your mind while expanding your skill set, changing forever your image of the communications profession – and how you perceive your role in it. 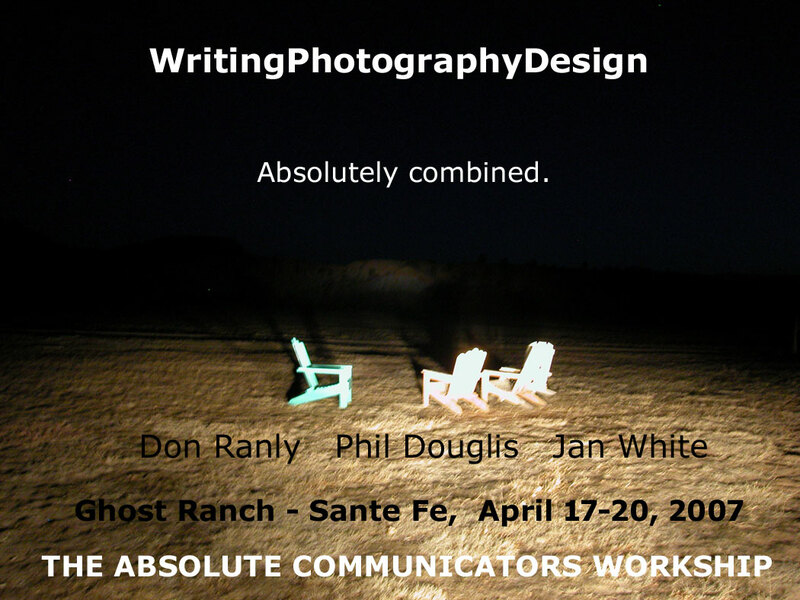 The Absolute Communicator Workshop is a unique, three-day, comprehensive workshop retreat, offered exclusively by Communitelligence. We are bringing together three preeminent leaders in the arenas of writing, photography and graphic design, who will jointly conduct sessions, for the first interdisciplinary workshop of its kind. Moreover, we purposely are limiting enrollment to enable you to totally immerse yourself in truly interactive learning and to receive professional coaching and in-depth critiques throughout the event. You will not find this level of attention or feedback anywhere else. And, with minimal downtime and maximal facetime, this workshop packs a wallop! Our workshop leaders are each widely recognized for their experience, knowledge and commitment to their areas of expertise. They understand and respect each other’s contribution to our common communication product. It is their unique insight not only into the need for cooperative thinking but into the joy of shared intellectual teamwork that makes them the ideal experienced guides to open your minds to broader perspectives in our shared profession/s. This event pools their talent for the first time ever. Thanks to their input, enthusiasm and collaboration, Communitelligence has developed a robust program that will delve into the creative process like no other.